Man Utd forward Alexis Sanchez came off injured during the FA Cup tie with Reading on Saturday and clearly wasn’t aware of the seating plan on the bench. Things may have changed in recent weeks after Ole Gunnar Solskjaer was appointed interim boss following Jose Mourinho’s sacking, and the Norwegian tactician has picked his seat in the dug out. Situated on the back row, he may feel as though he gets the best view of the game from there, but clearly no one told Sanchez about the rearranged seating plan. After he came off with what looked like a hamstring problem in the second half, the Chilean international went to take his seat. Unfortunately for him, he managed to pick Solskjaer’s preferred spot. 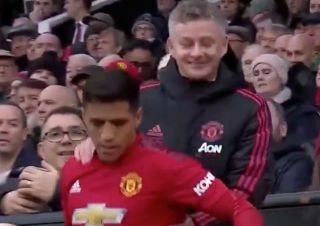 As seen in the video below, the United boss had to inform him that he had to move with a little chuckle, although it probably didn’t do much good for Sanchez’s hamstring!